I once lunched with Anthony Bourdain at the now-closed Pho Tau Bay restaurant on the West Bank. We each had a beer and a bowl of pho and discussed his latest book and our trips to Vietnam. It was 20 years earlier that I had researched the exotic cuisine setting up shop in eastern New Orleans, first tasted the pungent beef noodle soup and explored the 5 a.m. Saturday market stocked with vegetables I didn’t recognize. It was just five years before meeting Bourdain that I finished reading “A Cook’s Tour,” which left no doubt in my mind that Vietnam was his favorite country so far. So when I traveled there, a fellow food writer, my daughter and I struck out to find what appeared in the book to be his favorite restaurant in Ho Chi Minh City. The name escapes me, but not the experience. Motor scooters ran through the restaurant, and rice cakes encased in pottery were hurled through the air on their way to customers. Many didn’t make it, landing in broken pieces on the floor. But the food was the best. Like Vietnam, New Orleans held a place in Bourdain’s heart. He considered both places to have a soul, returning often to New Orleans and including Pho Tau Bay in one of his television shows. And now, with one of the largest Vietnamese populations in the United States, that cuisine has become a part of New Orleans. Its restaurants are everywhere, and some of us are cooking the light Asian food at home. The most popular dishes are pho, the noodle soup, and bahn mi, the Vietnamese poor boy served on French bread, which, like us, they learned to make from the French, who occupied their country years ago. Many local restaurants of different styles serve the crusty French bread made at Dong Phong Bakery in eastern New Orleans. With local Vietnamese hosting festivals in the true New Orleans spirit, we are further introduced to home cooking worthy of investigating. How fortunate we are to add this delicious and healthful way of dining to our favorite pastime. Like Bourdain, we find much of our lifestyle through food. 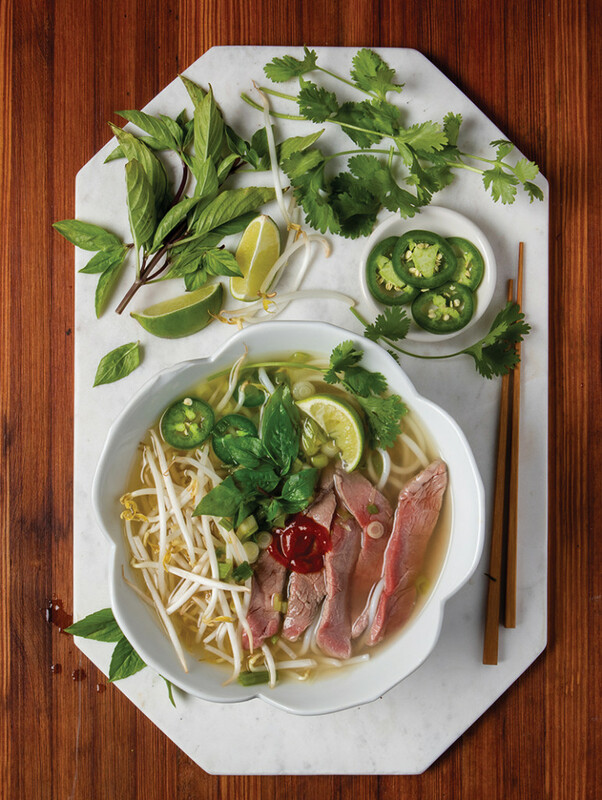 The attached recipe for pho bo gives you a choice – the easy way out or totally homemade. Both are delicious. 1. Place beef broth in a large pot over high heat. Add star anise, green onions and spice mix, and bring to a boil. Cover, reduce heat to low and simmer for 15 minutes. 2. Meanwhile, prepare a platter of garnishes – bean sprouts, jalapeno peppers, basil and lime wedges – for diners to add to their bowls of pho. 3. Place rice noodles in a large bowl. Pour boiling water over noodles to cover, soak until tender, about 15 minutes, and drain. 4. Prepare large individual serving bowls with 1 to 1½ cup of noodles, several sprigs cilantro and several slices of sliced of raw meat on top. Pour about 2 to 3 cups each very hot broth over all. The broth will cook the meat. If you like beef rare, serve it raw on the side, and let diners add it gradually to their individual bowls. 5. At the table, serve garnishes along with hoisin sauce, sriracha and bottled fish sauce (nuoc nam) on the side. Serves 6 to 8. *Vietnamese beef broth for pho and other Vietnamese ingredients can be purchased at Asian grocery stores, the largest of which is Hong Kong, which specializes in Vietnamese products in Gretna. **To make homemade beef broth, combine in a stock pot 3 pounds lean meaty beef bones; 1 large onion, cut into chunks; 6 thick slices fresh ginger; 2 lemongrass stalks, trimmed and sliced; 4 tablespoons fish sauce; 8 star anise; 1 teaspoon peppercorns; 2 teaspoon salt; 4 whole cloves garlic; 1 teaspoon sugar; 2 cinnamon sticks; 4 tablespoons pho beef-flavored base such as Cot Pho Bo, additional to the recipe, and 4 quarts water. Bring to a boil. Skim foam off top. Lower heat and simmer for 3 hours. Cool and strain. Makes 4 quarts.